It’s that time of year again, where in Japan everyone is shopping for their nengajou (traditional New Year’s cards), and adverts for snazzy printers that allow you to create, decorate and print your own are airing on loop. A few of my friends actually do this, and if, like a lot of Japanese people, I had a hundred or more to send, I’d actually consider it too. To tell the truth, I wouldn’t even bother with them if they just weren’t so irresistibly cute. The cards, the stickers, the stamps – I love it all! Every year they feature the Chinese zodiac sign of the coming year, and every year they are just as cute as the previous year. I really can’t help but buy them. So then, because I’ve bought them, I have to send them. And so it goes year after year. Today was the day I started on my 2014 year of the horse cards. I always get a little lazy when I have to write them, but I love sending and receiving them on January 1st. Every year there is a certain date by which you need to post them, and if you meet that deadline, Japan Post will definitely deliver your New Year’s cards on the 1st of January. The first time I heard that, I was so impressed! Imagine working on New Year’s Day! Only in Japan perhaps? Either way, I think it’s really lovely of them to do that. This post will be short and sweet as I need to keep at them. Have an enjoyable Sunday and week ahead beautiful people! Photographic evidence of my claims. I dare you to say they aren’t so cute they’d make your head explode if you received one. Ha, didn’t think so! I rest my case. 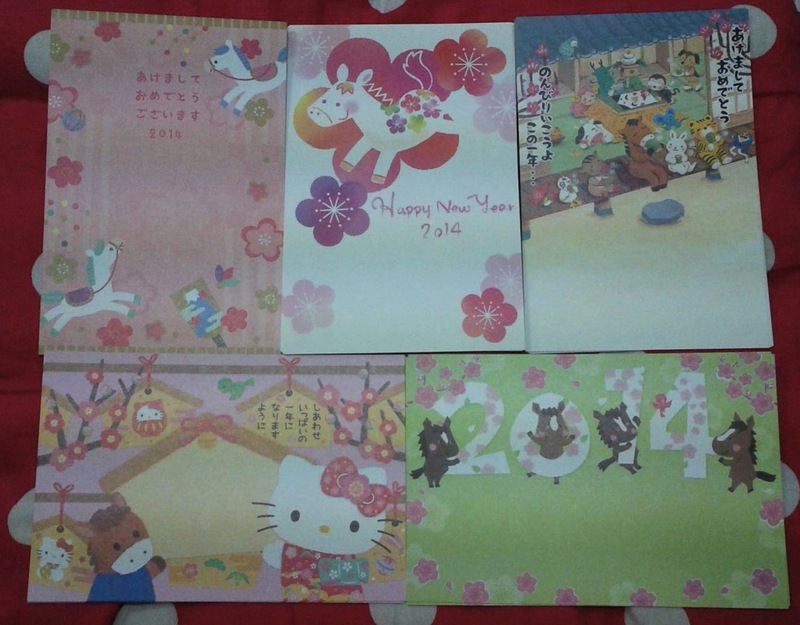 New year cards… they should do them in the UK as well. I would love to decorate these cards with cute stickers and just dish them out to everyone I know. Yep too cute, I like shopping for those as well but when I find cute ones they come in a pack of 5 >.< You picked really lovely ones! Aww thank you 🙂 I got them from the Family Mart near me, of all places! Awww these are adorable, wish we had cards like this in the UK, I went into Clinton cards the other day and the cards are so corny, these are miles better! I am such a sucker for nengajou. I think, oh, they’re so cute, won’t they be fun to send? Oh my, I expected actual horses, not Little Pony style rainbow creatures, they’re adorable!